I have a pasta maker sitting in the pantry but I haven’t pulled it out and made any pasta in awhile. 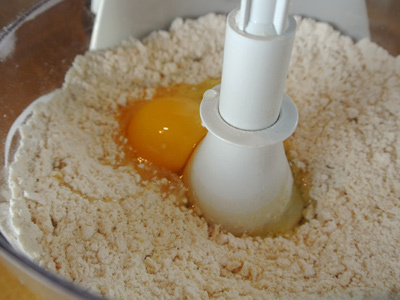 Pasta is relatively easy to make, it’s just a combination of flour, eggs and salt with a little olive oil and extra flour as you roll it through the pasta roller. But like pie dough it takes a little practice. Until now I’ve only tried ravioli once and without a ravioli tray I had a hard time of it. So I decided that next time I tackled ravioli I was going to get myself a ravioli tray and roller. I have to say I am so glad that I did, it made the job so much easier. 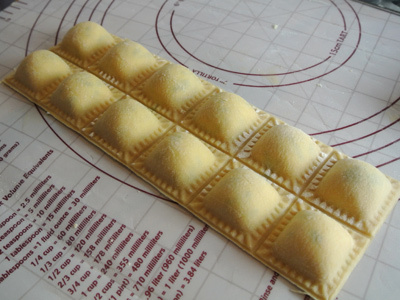 The cheese filling went a lot further than I anticipated and I was able to put up several dozen ravioli in the freezer. Now we can pull out just the amount we want for a quick meal. When frozen they hold together better when placed in boiling water and cook in as little as 6 – 7 minutes. And if you like toasted ravioli just thaw them first and they can be pan fried a couple minutes on each side. Start with the cheese filling so that the flavors can blend together. 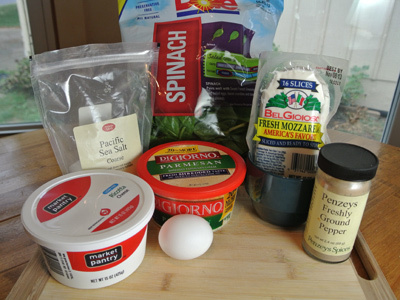 You’ll need some ricotta cheese, fresh mozzarella cheese, parmesan cheese, an egg, fresh spinach, salt and pepper. 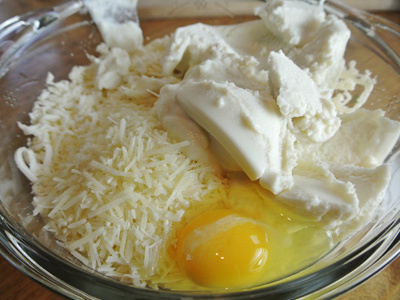 Grate the fresh mozzarella cheese and combine with the ricotta cheese, parmesan cheese and the egg. Mix together. 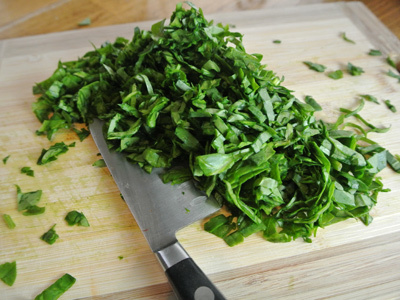 Chop 2 cups of the fresh spinach. Add to the cheese mixture and add salt and pepper. Refrigerate until it’s time to fill the ravioli. 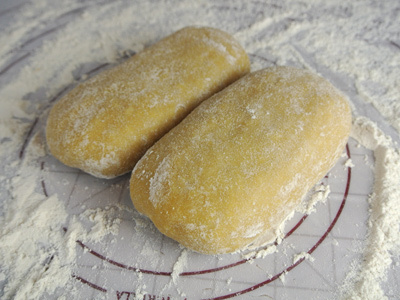 If you are making the cheese filling above you will need to make two batch’s of dough. 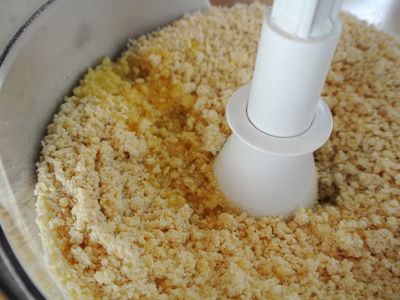 Some can make the pasta the old fashioned way but I prefer using a food processor for quick and easy work. For 1 batch you’ll need 2 cups of flour, 3 eggs, a teaspoon of salt and a tablespoon of olive oil. Once you’ve put this batch together, it’s easy to refill the food processor and make another batch. Combine the flour and salt. Pulse a couple times just to mix the two together. You can see the slightest big of crumbling. Time to add egg no. 2. Pulse several times. The texture is starting to come together, add the last egg and pulse several times. Add a tablespoon of olive oil and pulse a couple times. See if it will pinch together in your fingers, then form the mixture in your hand to make a ball. 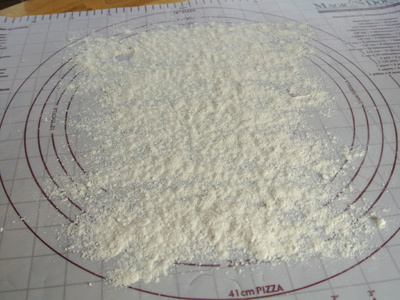 Flour a work surface. 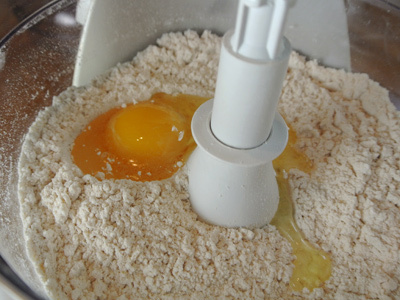 Flour is the biggest asset to keeping the dough pliable and from sticking together. 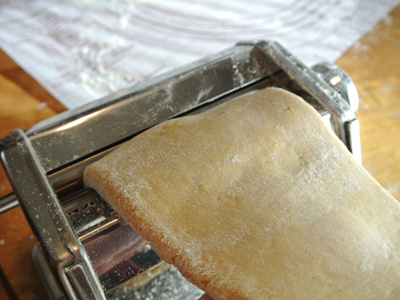 You’ll need to make sure to sprinkle the dough with flour each time before running through the pasta roller. 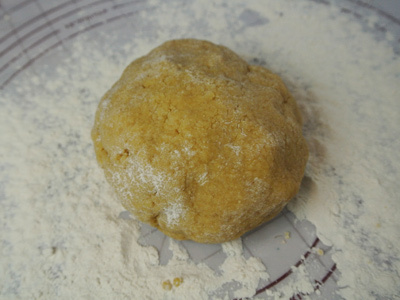 Once you have formed the ball of dough, coat it with some of the flour. Place in a zip lock bag and let rest for 30 minutes. The gluten will relax and make it much easier to work with the dough. 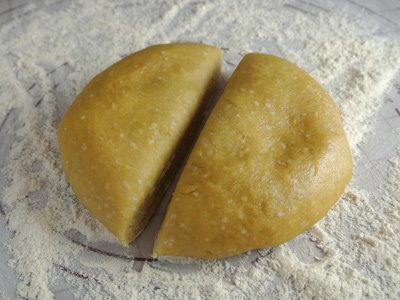 Knead the dough slightly and form into a flat disc. 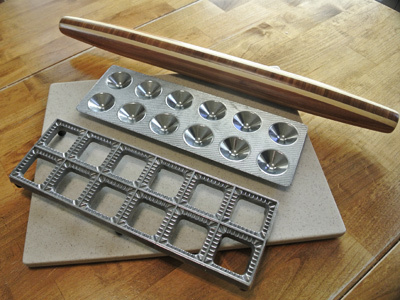 Cut the dough in half and form into 2 rectangle shapes. This will make it easier to run through the pasta roller. 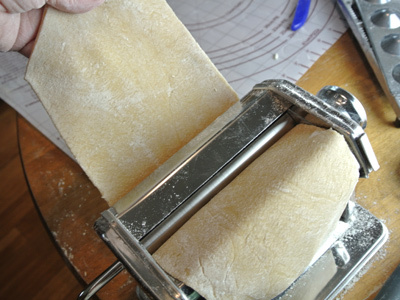 For me it’s easier to run the rolling pin over it a couple times to flatten it out and fit into the pasta roller. There are numerous videos online to show you the settings to roll the dough and how many turns through the roller before it’s ready to cut or fill. I think it’s one of those things you have to do a couple times and learn on your own. From my own experience I run the dough first through the thickest setting a couple times. And 2 – 3 times through the medium setting or thickness. 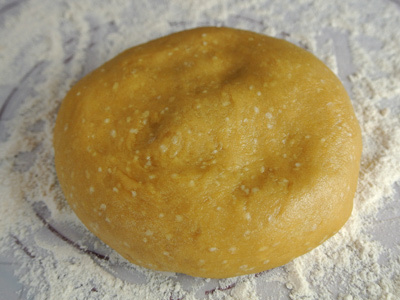 Remember to sprinkle a little flour on the rolled out dough before you run it through the roller. And finally once or twice through the low setting. Some instructions go with the thinnest setting, but I have found on my pasta maker that the dough is too thin to hold the ravioli filling and it will push through or it will seep through when set in boiling water. The next to lowest setting works best for me. 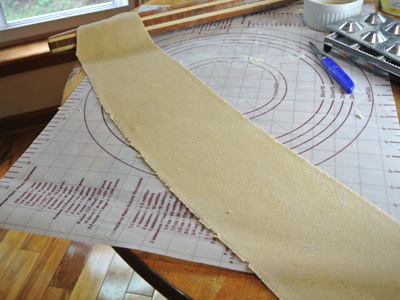 The final run through the pasta roller should produce a long thin sheet of dough, long enough to cover the ravioli tray twice. 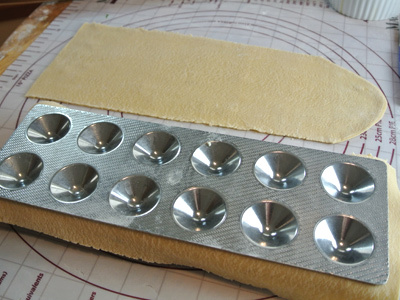 The first layer of dough will cover the tray. 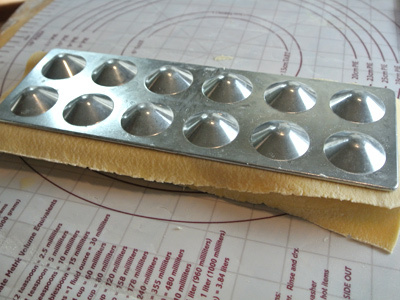 Then set the mold on top to make a small indention in which to place the filling. Remove the mold and set a small dollop of filling into the indention. 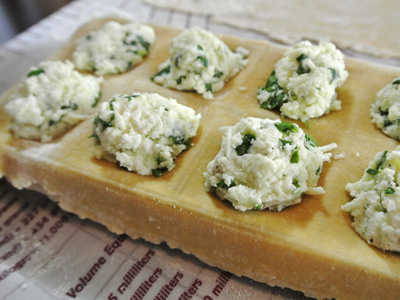 Press the filling down slightly then brush some egg wash around the edges and between each square. I didn’t get a photo of the egg wash but you know what to do. Set the second layer of dough over top. 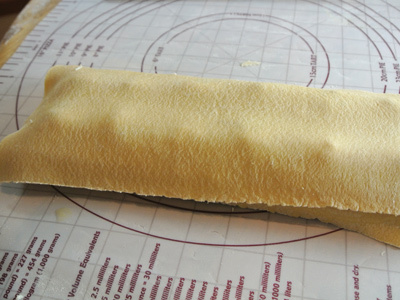 Now set the mold over top and press down to secure the edges. 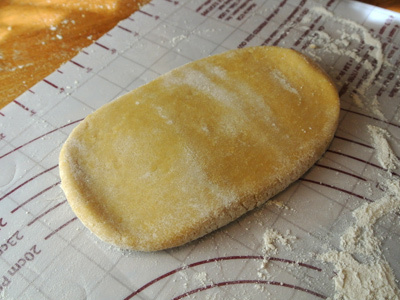 Use your rolling pin to gently press the dough through the tray to make the ravioli. This will press out all the air bubbles and seal along the edges. Take a knife and cut around the edges of the tray, then turn over to release the ravioli’s. 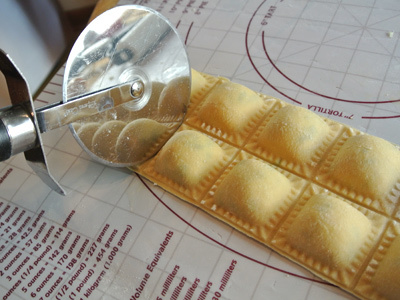 Use a pastry cutter or pizza cutter to make individual ravioli’s. 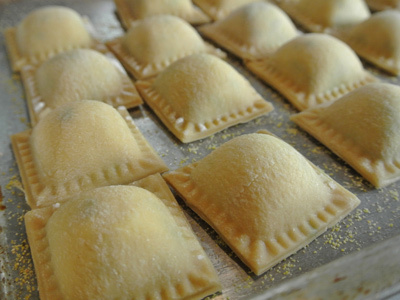 Sprinkle a baking sheet with cornmeal and place individual ravioli’s on the sheet. Set the tray in the freezer for 1 hour, then place in ziplock bags, mark with date and filling and freeze until time to use. Place in boiling water for 6 – 7 minutes. Serve with pasta sauce. Combine all ingredients. 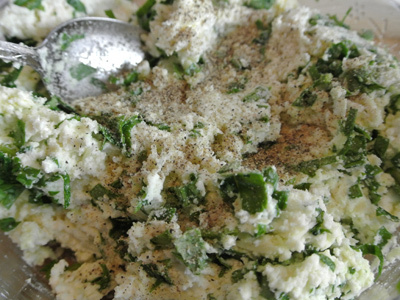 Mix well to incorporate and place in refrigerator to let flavors combine. 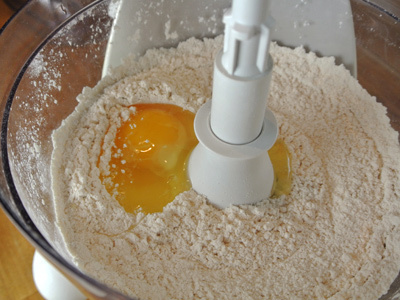 In a food processor combine flour and salt. Pulse a couple times to combine. 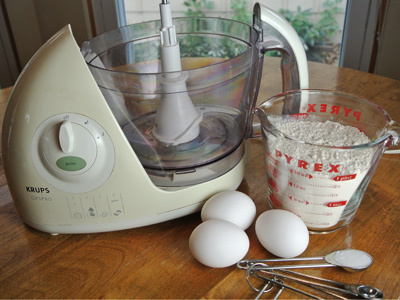 Add eggs one at a time, pulsing a few times after each addition. Add in the tablespoon of olive oil and pulse. 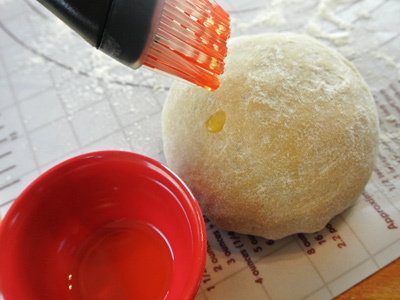 Test the dough by pinching between your fingers, then form into a ball. If too dry add a bit more olive oil. 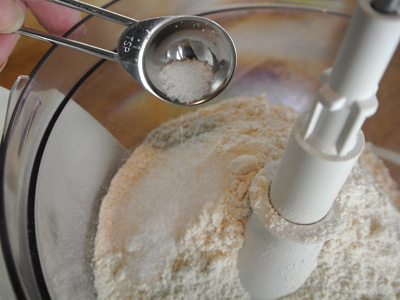 Sprinkle flour on a work surface and knead a little bit of the flour into the dough and mold into a smooth ball. 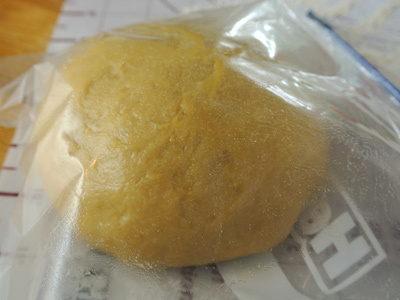 Brush additional olive oil over dough and place in a zip lock bag to rest for about 30 minutes. This will allow the gluten to relax and will be easier to work with the dough. Make a second batch of dough or double recipe for the amount of cheese filling used. Makes 4 -5 dozen ravioli’s depending on size. Wow.. homemade ravioli from scratch, these must taste AH-MAZING! It’s one of the things I wish I made more often, truly worth the effort.